Handwritten letters are always a delight to receive, but who really bothers with paper and pen when sending an email is so much easier? 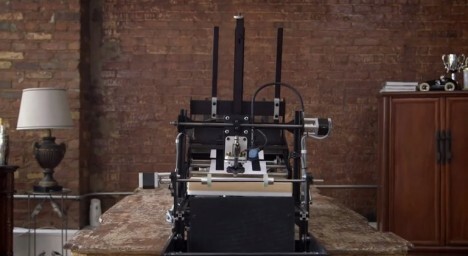 A company called Bond is using robots to reinvent the way we send personalized correspondence. 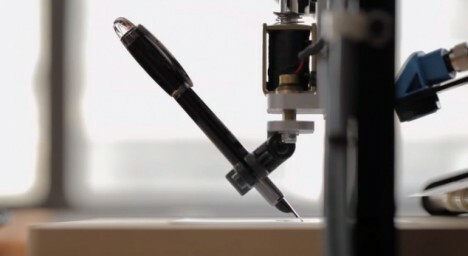 The idea is really simple: you use your computer or phone to send to Bond whatever you’d like written on a card or letter, then the writing ‘bots use your own handwriting or a stored calligraphy style to carefully write it out on paper. The envelope is sealed with a wax seal and then sent out for you. Bond acquires your handwriting through a sample you provide or, if you only communicate in chicken scratch writing, you can choose one of the styles offered on Bond’s website. Whether in your own handwriting or some random pretty calligraphy, the service saves you the irritation and pain of having to write out every single note yourself. The robot-centric service is perfect for recently married couples who need to send tons of thank-you notes or for businesses that want to add a personal touch to their correspondence. There’s a $199 setup fee for Bond to acquire and store your handwriting, but after that you can send cards for $2.99 each – less if you’re making a large bulk order.